UEP’s Principal Investigator, Andy Miles will be outlining UEP findings at this Voluntary Arts Network event at Salford University. “When Salford took the bold step of acquiring the docks, the area had a declining industrial base with high unemployment, poor housing and a degraded physical environment. It is now home to high-tech industries (BBC, ITV, Independent Production companies etc.) new flats and apartments, retail, leisure and sporting facilities, museums and art galleries (Lowry & Imperial War Museum). Contrast that with the adjacent Ordsall housing estate, which is one of the disadvantaged and deprived communities in England, ranked 399 out of 32,482 in the latest Index of Multiple Deprivation (IMD). 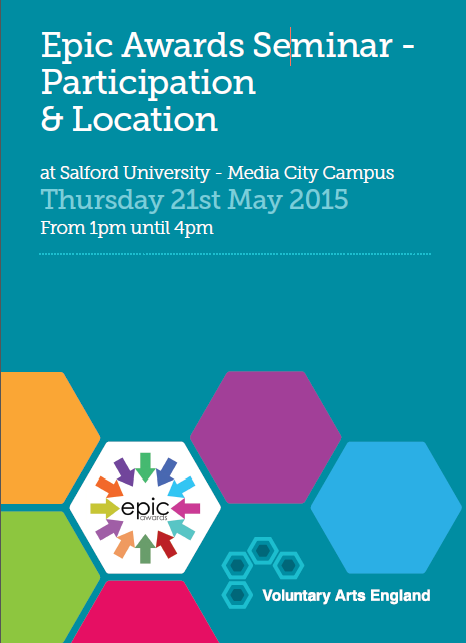 Be aware of the variety of cultural partnerships underway in Salford and what they are achieving. Be aware of the impact that embedded arts projects can have on local communities. Understand more about ‘Our Cultural Commons’ and the work of Voluntary Arts. This entry was posted in General News by Susan Oman. Bookmark the permalink.